The day before yesterday I got sunburned under the scorching sun at our local Sunday market. It almost hit 30 degrees. Then within a flick of a swith, that all changed. Wave goodbye sun and hello rain! From 30 down to 11, SubhanAllah. So yesterday I had to wear 3 layers of clothing because it was freezing. But why am I acting all surprised? I’ve been living here for the past 10 years. That’s Melbourne! So if you ever want to experience 4 seasons in a day, book your next flight down here! This is what we usually have on a chilly day. Soup. Chicken noodle soup. A hot bowl of this in your hands on a couch with the family is what I call comfort food. And don’t forget the blanket of course. Yes I know I’ve been making a lot of easy dishes lately. I don’t exactly want to scare you off Malaysian cooking. Buy hey, if you’re an adventurous cook, why not try my chicken rendang recipe here. You can also make it with beef but let me warn you, be prepared to stay in the kitchen for up to 4 hours! 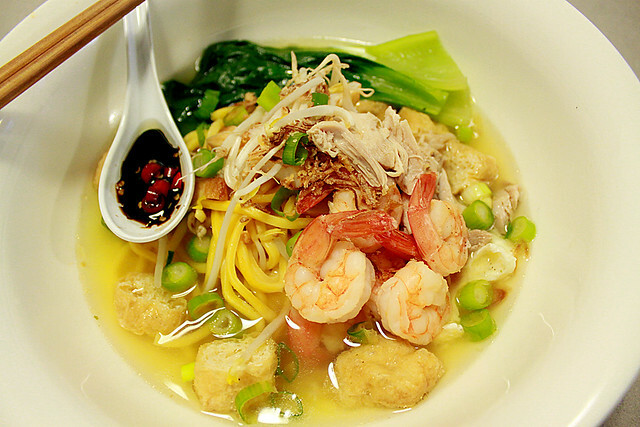 For now, here is the recipe for this amazingly yummy and easy soup. 1. Marinate the prawns with garlic and set aside. 2. In a stock pot, boil water with the chicken neck/bones along with the chicken breast chunks and vegetable stock. Bring to a boil. Remove excess chicken foam floating on the surface. Then leave to simmer for 40 minutes covered. 3. In a pan, sautee the marinated garlic prawns until evenly cooked through. Set aside. 5. Throw away chicken neck/bones as well as the 2 garlic cloves from the stock pot and remove the chicken breast pieces to a chopping board. Back to the stock pot; season with salt and pepper and add the cooked prawn pieces and asian greens. Give it a quick stir. 6. Turn off the stove but lid on. 7. 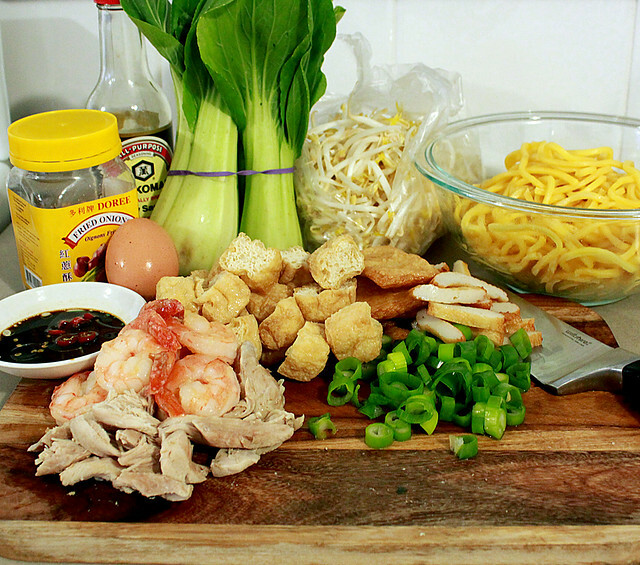 In the mean time, slice the chicken breasts into thin long strips and divide them as well as the noodles, tofu puffs, fish cake slices, boiled eggs, bean sprouts, spring onions and fried shallots between 3 bowls. 1. In a small serving bowl, combine soy sauce, chilli and sesame oil. My tip for a tastier soup is to put one teaspoon of fried shallots in the pot just towards the end. It’ll be soggy, but boy, I tell ya…it adds a hint of shalloty flavour that simply bursts in your mouth! Click ‘Read More’ to print the recipe and leave a comment. Hi, you have a nice blog with all wonderful pictures. 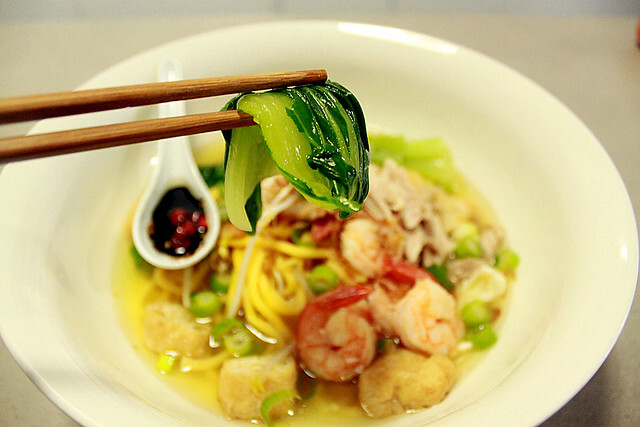 Your bowl of noodles look so delicious.